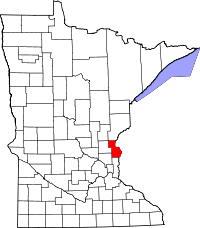 The Chisago County Historical Society offers a huge amount of genealogical research options, both online and physically at its research library. While the library is open every day, it is preferred that researchers schedule an appointment beforehand. The library can be emailed or called at (651) 257-5310. In addition, the Chisago County Court Recorder records and provides access to the vital records for the county. The office has birth and death records, as well as marriage indexes and military discharge records, however certain records are limited as to who can view them. For instance, military discharge records are, unless otherwise stated by the filer, not part of the public record and can only be viewed by the original recipient and certain family members. Birth certificates are $26 for the first copy, and $19 for extra copies of the same record, and death records are $13, and $6 for extras.